Feeling secure is peace of mind. Schlage Sense Smart Deadbolt is just that, plus it gives you additional levels of smart features with ease of use that make it a “must have” addition to your home security arsenal. 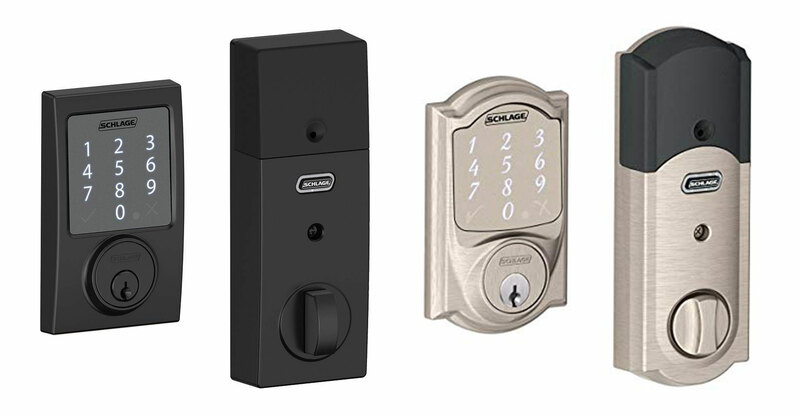 We have reviewed smart locks in the past, but Schlage has proven it not only has the security and smart features we were looking for, but also has the elegant design that improves the look of your door versus making it an eye sore. Schlage Sense Smart Deadbolt comes in two designs: Camelot trim and Century trim. The one we are reviewing is the Camelot trim and comes in Aged Bronze or Satin Nickel. The look is clean and simple. The illuminated touchscreen has a modern feel and makes it much easier to see and use versus trying to feel for the keyhole with your key in the dark. Although the use of the touchscreen is the main design feature, there is the traditional keyhole in case the battery runs out or the keypad stops functioning properly (hasn’t happened yet). From the inside, the deadbolt looks like any other deadbolt and is non obtrusive. However, the whole alarm assembly that the deadbolt fits on is pretty big. It looks like a little black box, but the shell is simple and holds the guts to the alarm and battery case.  Overall, the design is still better than other deadbolts we’ve reviewed and more elegant than those that are currently on the market. Installing the Schlage Sense Smart Deadbolt was easier than I thought it would be. I set aside a couple of hours because I was sure I would run into some issues with things not fitting properly, but I was done with everything in under 20 minutes. Getting the proper fit for the deadbolt so it would fit into the Reinforcement plate took a few minutes, but wasn’t too bad after I chiseled out some wood in the door frame so it would slide into place using the keypad versus actually turning the lock manually with some added force. Once the bolt and plates were in place, I installed the Touchscreen Assembly, then ran the wire through the door knob hole, support plate, and into the backside of the Alarm Assembly. Then it just a matter of screwing everything in and adding batteries to the Alarm Assembly so I could test it out. Although you can use the Schlage Sense Smart Deadbolt without the App, it kind of defeats the “Smart” feature if you don’t. 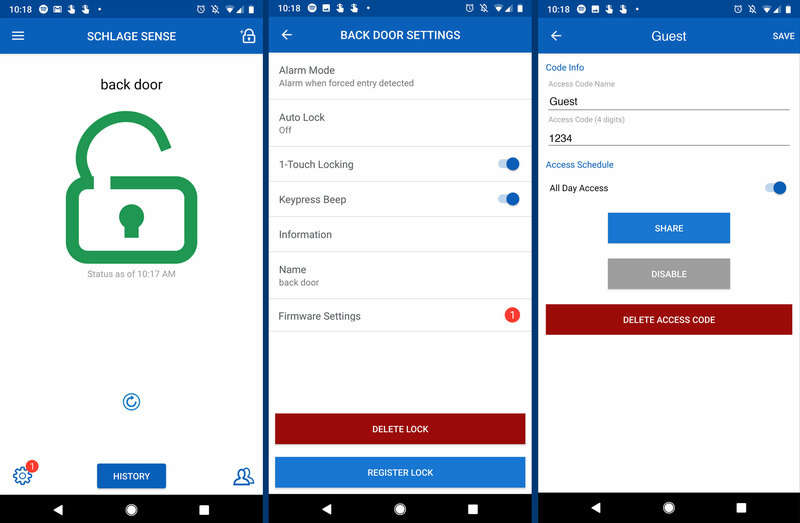 So in order to really get the best use out of the Deadbolt, I had to download the “Schlage Sense” app from the Play Store and set up a free account. Once my account was activated, I went through the setup to connect my bluetooth to the Smart Deadbolt and program my own four digit key. Once I was properly connected, the options to adjust the “Alarm Mode”, add “Virtual Keys”, and manage “Access Codes” were just a couple clicks away. The settings panel allows you to enable Auto Lock, 1-Touch Locking, Keypress Beep, as well as adjust the Name and update the Firmware. Adding a Access Code was really simple. Just give it a name and a four digit code, then set the schedule (All Day Access or specific time frames), then share it with whoever you would like to have access. You can always delete the Access code or change the 4 digits later if you decide you no longer want that person to have access or the code has been compromised. You can expand on the usability of your smart deadbolt, by well… making it smarter with the addition of the Schlage Sense Wi-Fi Adapter. This adapter gives you the ability to lock and unlock your door from anywhere in the world. 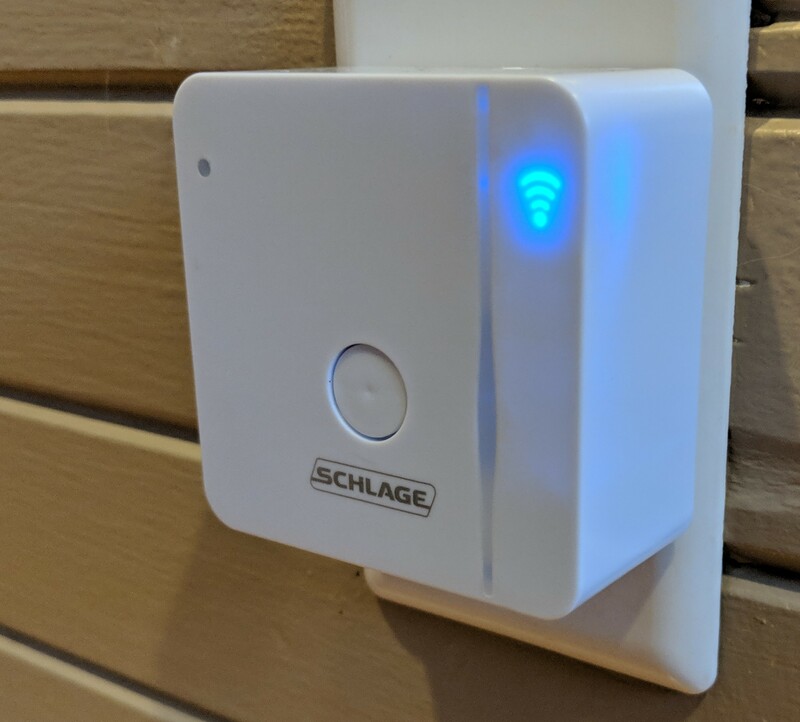 Since the Schlage Sense Wi-Fi Adapter connects to your home’s WiFi, it can be accessed and controlled anytime and anywhere (so long as your home WiFi is up and running and you have a decent cellular connection with your phone). Taking it a step further, you can also pair this adapter with Alexa. Once you download the Sense skill through the Alexa app, you’ll be able to say “Alexa, lock the front door” and like magic, the smart routine triggers and the Smart Deadbolt locks. By default, you cannot tell Alexa to unlock the door without going through the app and specifying that she has permission to do so. Because if a burglar is smart enough to know you have Alexa or a Smart deadbolt, they could simply yell from outside your house “Alexa, unlock the door” and Alexa would welcome them right in. But if you name your lock something very creative that no one would guess, then this could be a cool action to enable if you feel comfortable. You can also ask Alexa if the Deadbolt is locked or unlocked just in case you didn’t feel like reaching for your phone or getting up to check. Overall, this adapter is super easy to install and definitely a huge bonus feature that helps expand the Smart deadbolt capabilities. The Schlage Sense Smart Deadbolt is normally priced at $229, but you can currently buy one on Amazon for $168. Even at $229, it’s not a bad deal compared to other “Smart Locks” on the market. 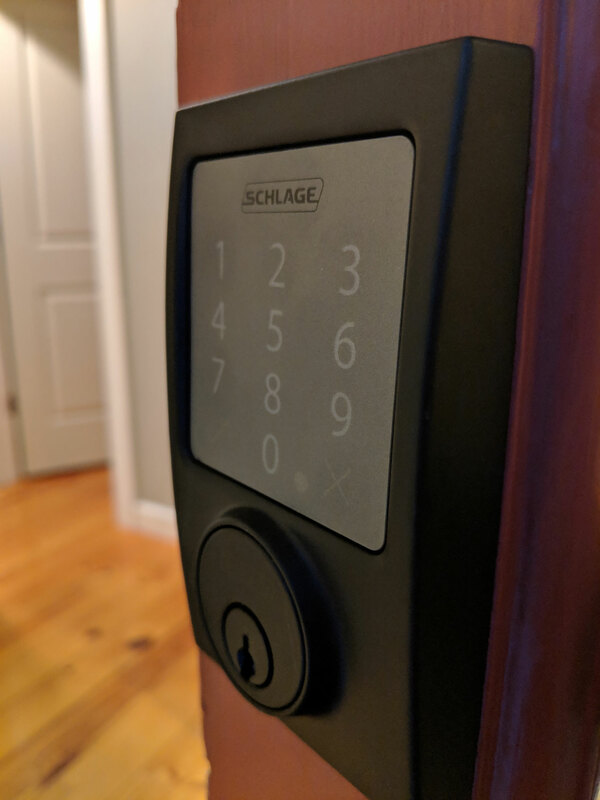 With the simple and elegant design and smart features with the App, the Schlage Sense Smart Deadbolt proved to us that it had true value and added security that makes it worth the $229 price tag. 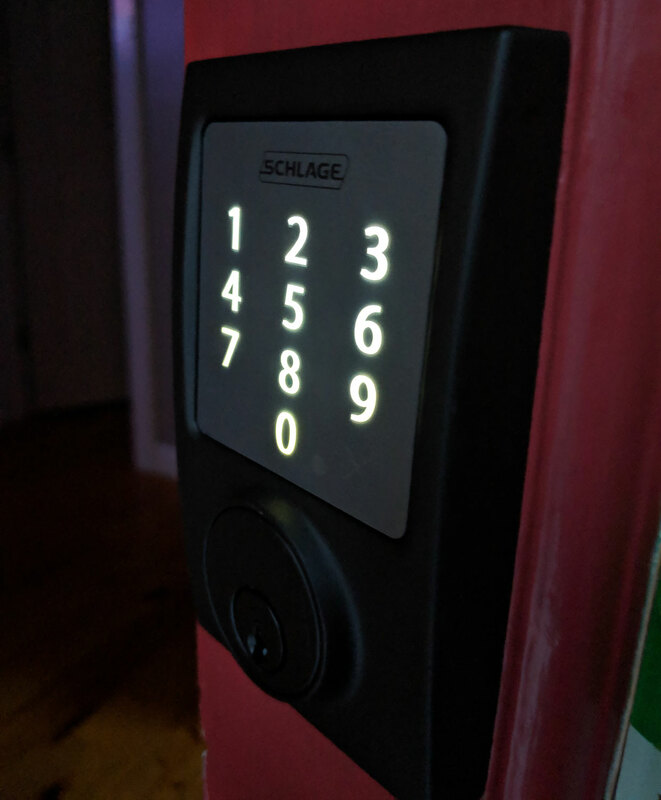 So if you are looking for an easy to install and use Smart Lock that you can share with others (you trust of course), then I highly recommend looking into the Schlage Sense Smart Deadbolt. Overall, the Schlage Sense Smart Deadbolt is everything we were looking for in a "Smart Deadbolt" system. It has all the smart features that matter and even more that can be expanded upon when paired with the Wifi adapter and Alexa. The Schlage Sense does not work with Apple TV 4 which is about 10 ft from the door. Even after many resets, the Schlage is still not shown on “HOME” app.